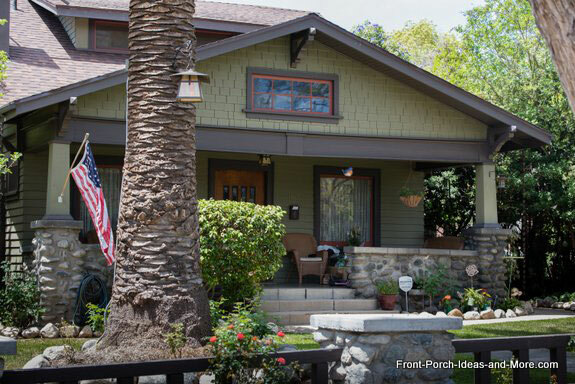 South Pasadena, California, is a front porch paradise. 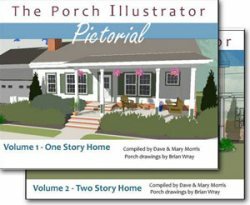 Tree-lined streets and sidewalks give way to some amazing front porch designs, many of which are Craftsman-style porches which Mary and I love. Fair Oaks Pharmacy and Soda Fountain and The Rialto Theater, one of the last remaining single screen theaters in the Los Angeles area, are not only historical locations but also reflective of this quaint community in a huge metropolitan area. 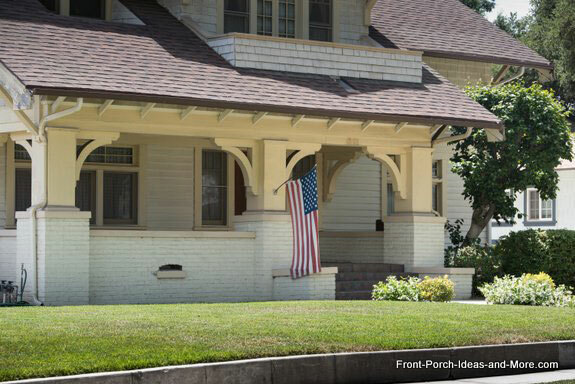 Front porches help define a community and a neighborhood and the porches of South Pasadena, California, we found do just that. 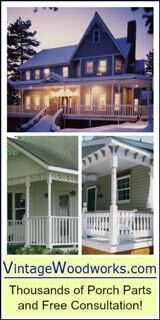 The following porches are just a small example of the many designs we found. 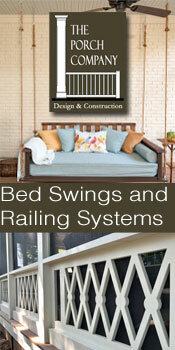 We will point out specific characteristics and details to help you design your own perfect porch. Many of the features, from roofs to foundations, can be used as seen or modified to fit your specific requirements. 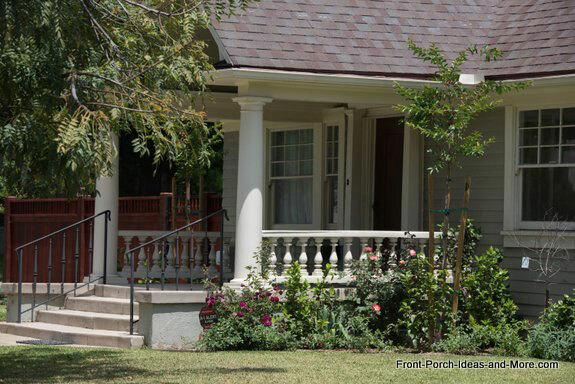 We hope you enjoy the porches we've selected as we had a wonderful time photographing them for you. 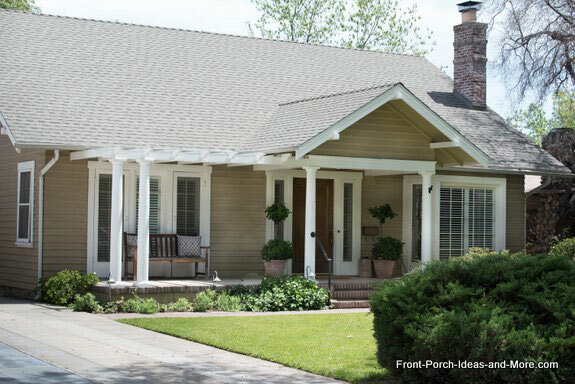 For those with a high gable on the front of your home, consider adding a gable roof for your porch as depicted below. In most cases it will provide sufficient space for a deeper front porch. Also note the color combination on the porch above. Complementary colors on the home were applied to the trim, porch columns, and balustrade (railings) as well. 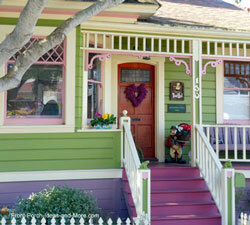 Color is an easy way to create lots of curb appeal. 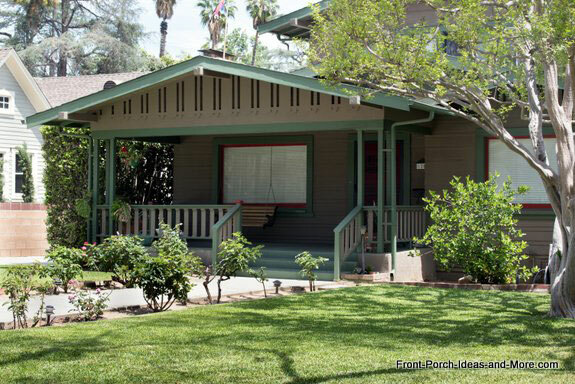 Here's another example of a double gable Craftsman-style roof design (and one our favorite porches). 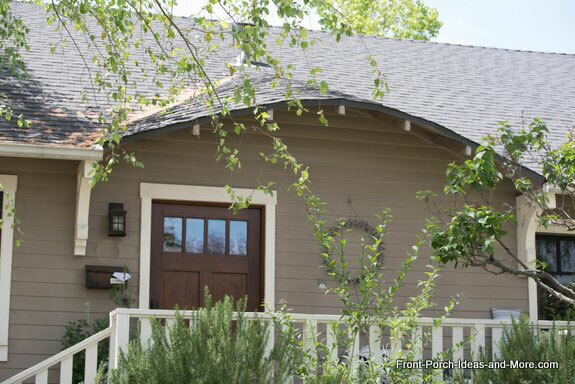 Craftsman porches, by design, lend themselves to this roof design which is fairly typical. Note the first photo is a "closed" gable while the latter is an open gable and how each style affects the overall appearance of the porch. We found this closed gable roof design quite interesting and aesthetically pleasing. We were pleasantly surprised at the many variations we found of closing a gable end, this being one of them. We also like the balustrade on this front porch. Mary and I thought this was an interesting roof design. We do not know if this was part of the original design or installed to support the porch roof due to other issues that may have occurred later. 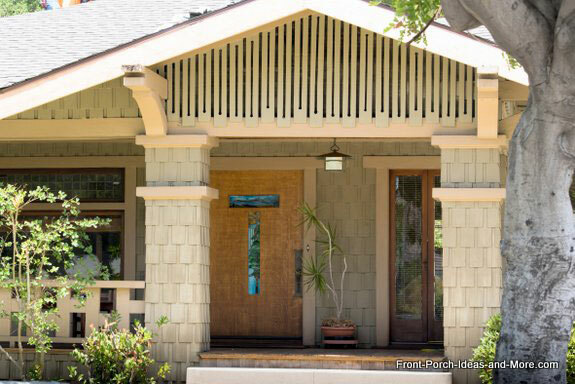 Here's another unique front porch roof design which we hadn't seen before. 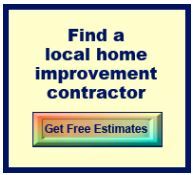 We could see this working on many ranch and cape cod homes. Additional depth might be obtained by extending such a roof design and supporting it with columns. We like the idea of extending a small porch by using a pergola over a patio area. 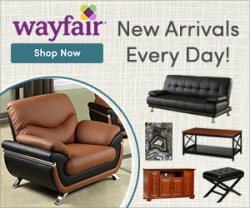 This works really well for ranch and cape code style homes. 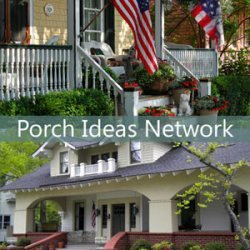 See our patio porch section for more ideas for expanding your porch. 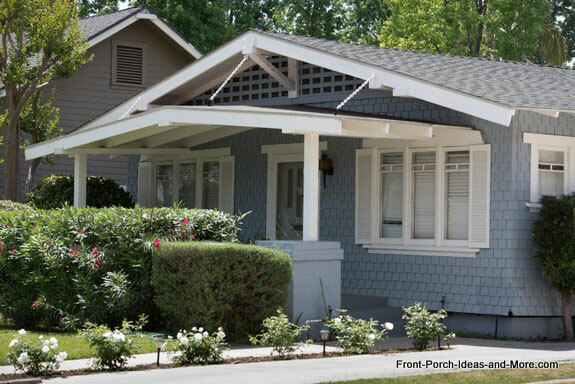 Another option often overlooked for those without a porch roof is an awning. Awnings come in a wide variety of colors and fabrics and can be an easy solution to protect you and your guests from the weather. Who wouldn't love this front porch for themselves? 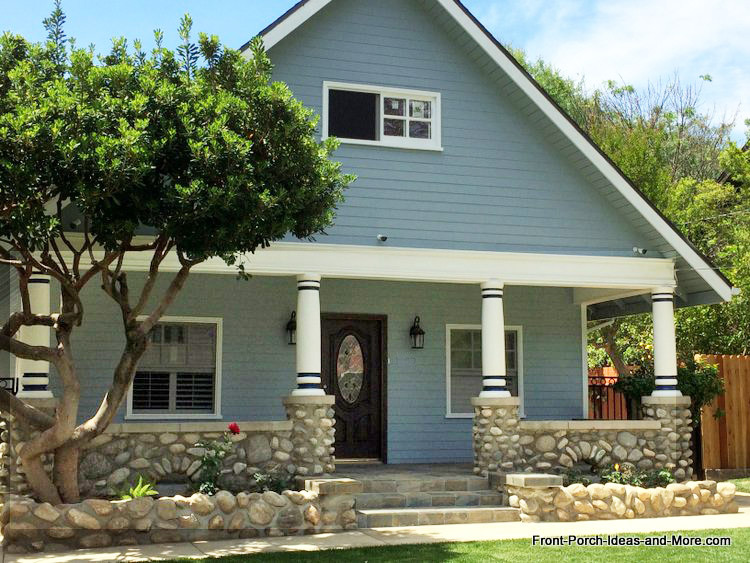 Wide and long, this front porch with the window in the gable, is truly beautiful. Love the stone balustrade. Don't forget the landscaping. The landscaping around the porches is a great match in each photo above as is the use of planters and appropriate foliage in the following photo. The planters add another dimension to this small front porch along with color and interest. When you don't have a yard for landscaping, use attractive planters as an alternative. 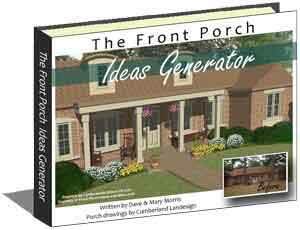 We are always on the lookout for front porch landscaping ideas to share. The right landscaping can really enhance the look of your porch. 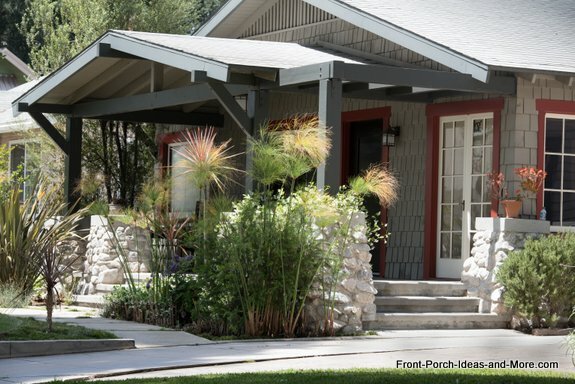 We thought this landscaping added a bit of charm to this front porch in South Pasadena, California. 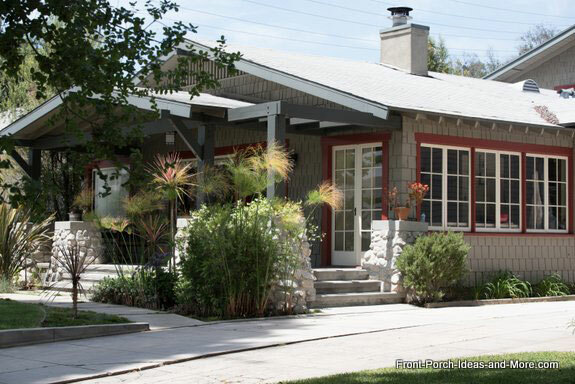 Perfect example of Craftsman-style porch columns which are indicative of large posts on stone pedestals. Also note the use of column brackets on both the sides and faces of the columns. 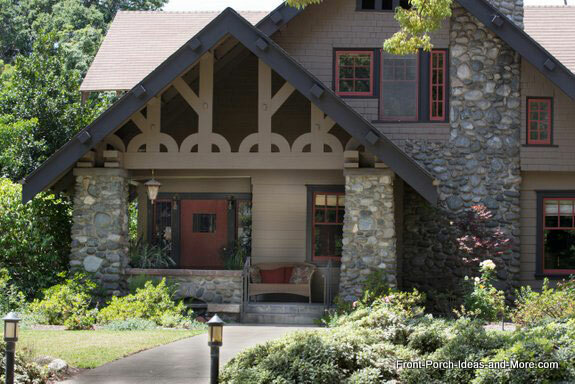 Tapered stone columns and heavy wooden features are all classic components of Craftsman-style porches as shown below. We like how they integrated the stone porch balustrade into the retaining wall for the landscaping. 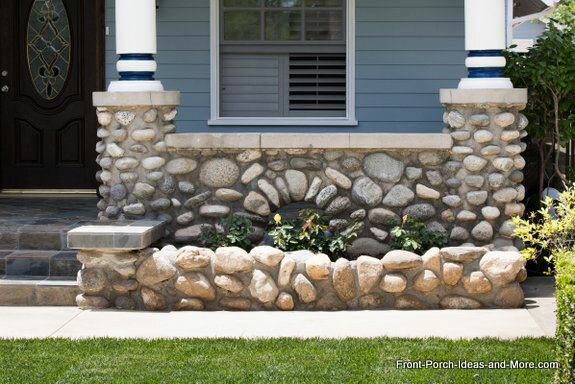 Stone balustrades are fairly common around South Pasadena, California - we really like them. 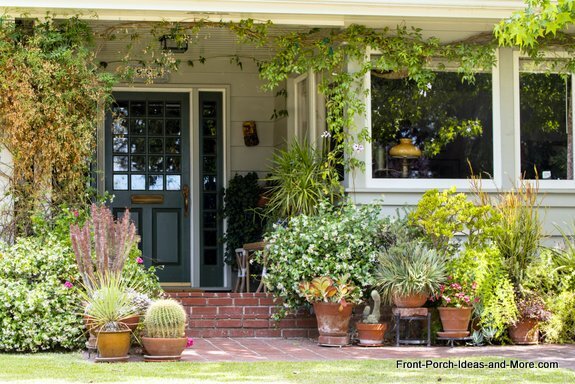 South Pasadena porches can also boast about front doors. 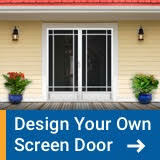 We saw many attractive doors that definitely add appeal and beauty to their homes. 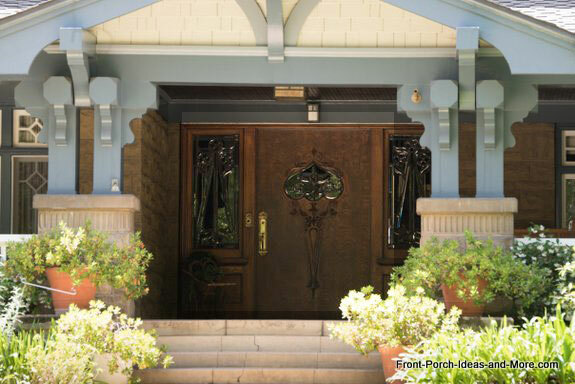 Would love to relax on these nice wicker chairs beside this classic Craftsman style front door. Yellow may not work for everyone but this is quite attractive against the blue. 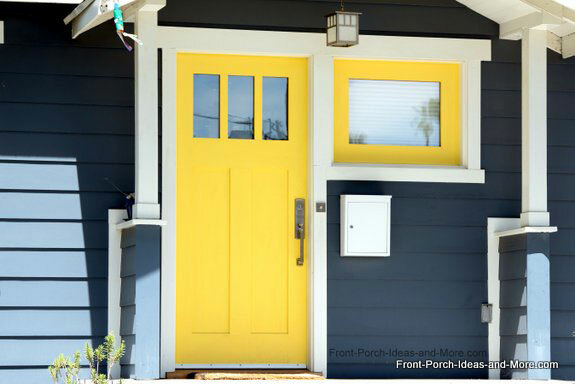 The yellow window frame adds extra interest and is a neat idea to complement a window frame with the door's color if you have a similar setting on your porch. 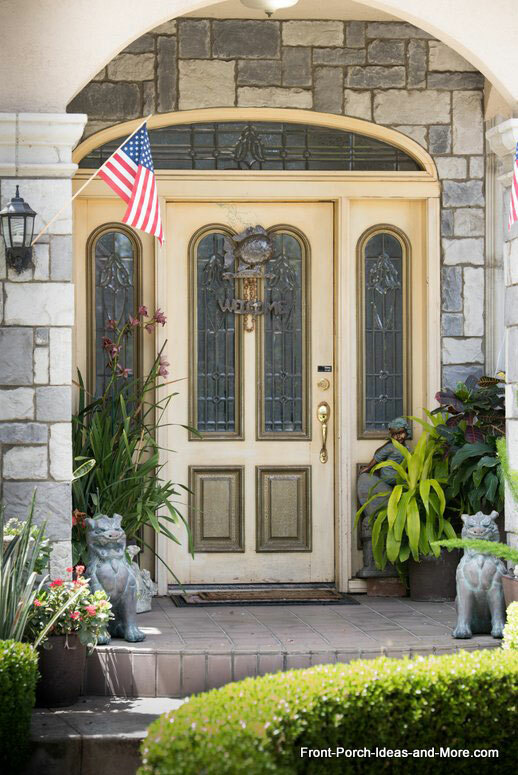 For more front door ideas for your porch and home, be sure to check out our front porch door section. This airplane bungalow is a real beauty. 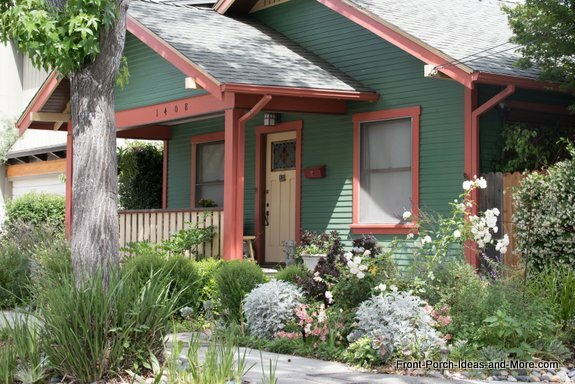 Although it doesn't have the typical feature of a Craftsman home, it has a unique architectural style. 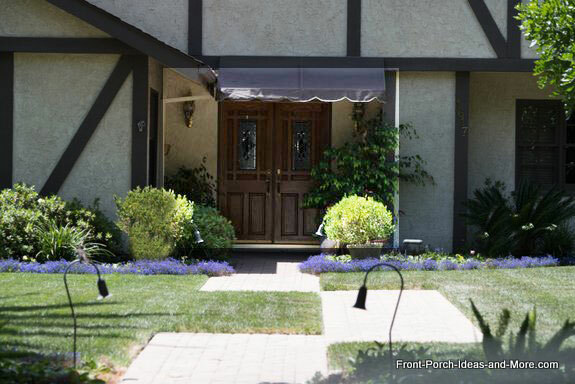 Mary and I had a great time in California searching for porches. If you ever get the opportunity, please visit South Pasadena, California. 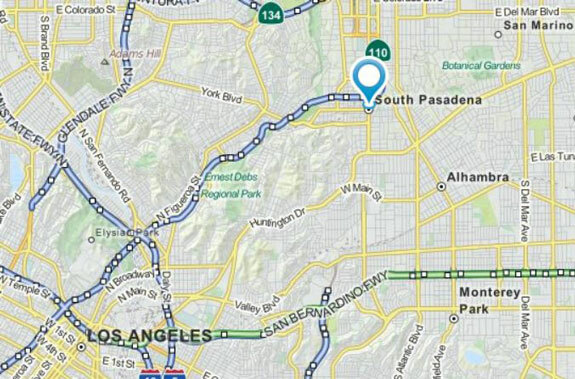 This quaint community in the heart of the Los Angeles area is a place you don't want to miss, especially if you love porches! Our son and his family have lived in Rancho Palos Verdes for a few years and lucky us - we get to travel there often. 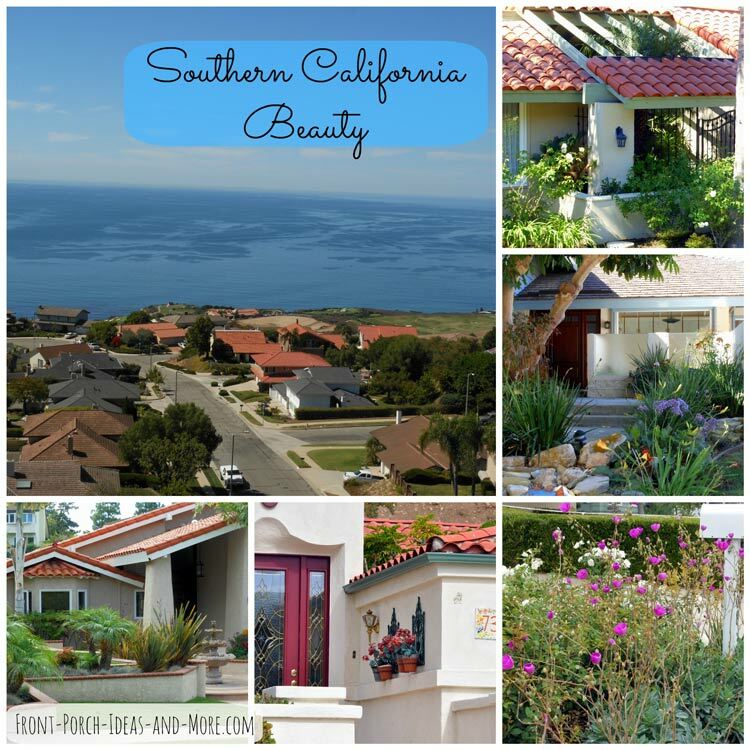 What a fantastic town overlooking the Pacific and it is less than an hour from South Pasadena California.